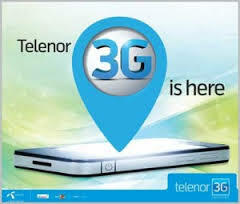 Pakistan’s second largest cellular operator by user-base, Telenor Pakistan, has declared to integrate its 3G network coverage to 32 cities by end of this month. Mr. Irfan Wahab Khan, Chief Marketing Officer, Telenor Pakistan made this announcement during a press gathering in Karachi.  Complete Rawalpindi-Lahore G.T. Road. 3G services free trail will be provided to Telenor Pakistan’s subscribers in these over a span of 15 days. The users will be made aware about the closure of free 3G trial service through SMS and Telenor Pakistan’s official webpage. Under the free 3G trial offer, customers can enjoy 50 MBs of free data every day. Data facilities on 2G will be charged as per normal. He also added Telenor Pakistan has felt great pride to offer its quality service to Pakistani user and it has been given a massive response in recent months and as a new growth area 3G is going to encourage the device and applications eco-system in Pakistan, thus resulting in more and more economic growth and employment opportunities.